So this was a nice surprise. 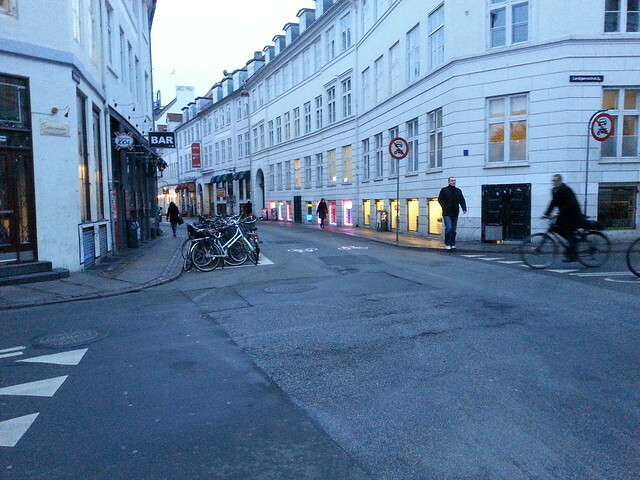 I had an early morning meeting in the City Centre and discovered that Vestergade is now a Bicycle Street (cykelgade in Danish). The Dutch call them Fietsstraat, I believe. We have one in a quiet neighbourhood already and they have one in Aarhus, but this is the first decent one in Copenhagen. 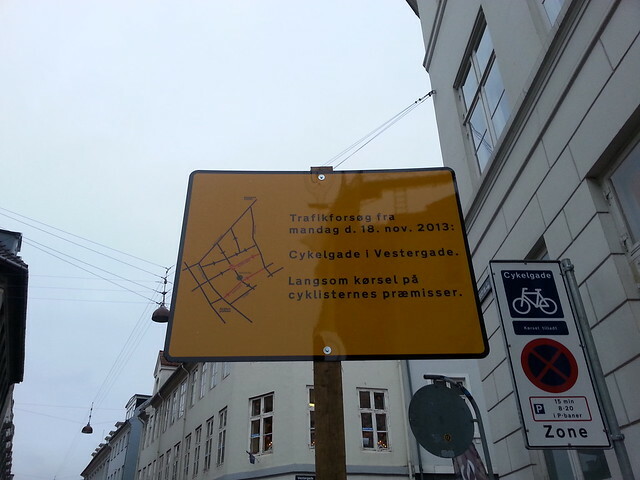 Basically, as the sign says, there is only slow driving allowed on this street and the cyclists decide the flow and tempo. It is one way for cars but cyclists are free to ride in both directions. The idea is nothing new. 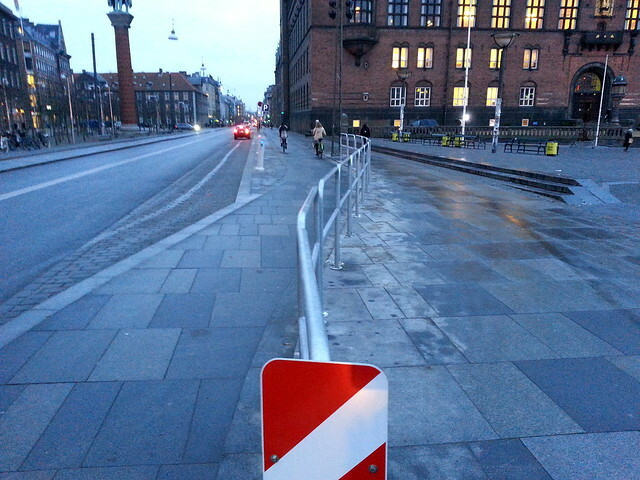 Rest assured, there has been a lot of effort to implement these Bicycle Streets for a long while but the Copenhagen police - like with so many other bicycle-related issues - have refused to allow it. Bizarrely, they can veto things they don't understand, without being obliged to say why or refer to any evidence. Now we see that a Bicycle Street is in place, if only for a test period. But it'll work, so I'm counting on it being made permanent. I spotted a couple of other things the other day, whilst riding on the Bicycle Superhighways for a project that Copenhagenize Design Co. is doing for the Capital Region. 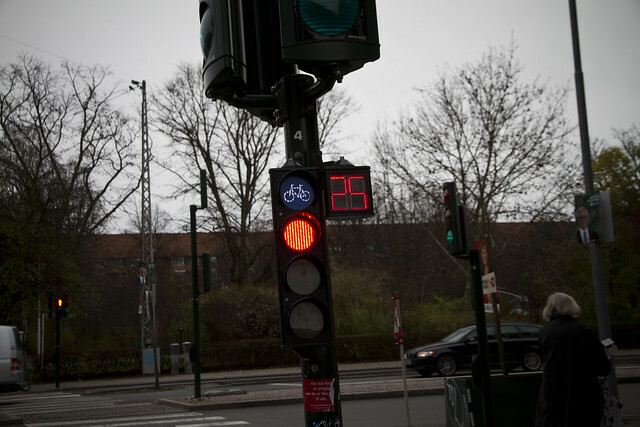 A countdown signal for cyclists at a traffic light. 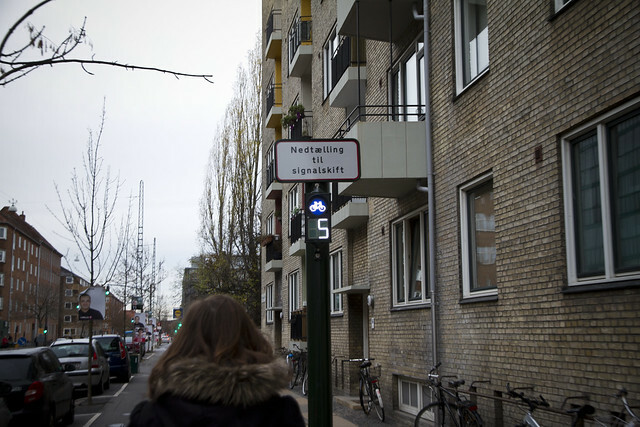 It is in place in many cities for pedestrians and I've seen them in some Dutch cities. I don't really see the point on a cycle track, but hey. THIS idea is cooler. It's a countdown signal a hundred metres or so BEFORE the light at an intersection. It simply counts down to the next light signal change. If the light is green, it counts down to red and vice versa. It's great and practical. If the light is red up ahead you can see how long before it turns green and slow down accordingly. Nobody likes having to put their foot down on a bicycle so this allows you to adjust your speed to hit the light. If the light is green, it tells you how long before it turns red so you can speed up to make it through the light. Increasing the flow in bicycle traffic. A nice touch. Then there's this. A new cycle track alongside City Hall. It's been there for a while now, after the street was redone. For some bizarre reason, the City decided to play around with a new surface - using these paving stones that look a lot like the ones on the sidewalk and only having a tiny curb separation between them. This is an area with lots of tourists and they can't see the difference between them. 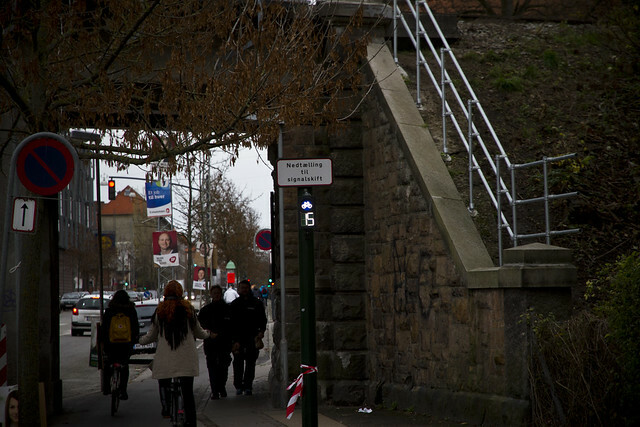 There are few pictograms indicating cycle tracks and you often see people walking on them. This idea was a complete brain fart. Useless. And I suppose the City has realised it. Now they have been forced to revert to 1970s style, putting up a fence to pen in pedestrians and keep them off the cycle track. Bicycle infrastructure everywhere else in this city is hand in hand with pedestrian facilities. Separated and parallel. Here, there is confusion - and a waste of money on the fence. It also looks horrible. The City used paving stones in this style out in the Ørestad neighbourhood, but they bought some cheap rock so they ended up ripping them out and replacing them with the standard asphalt they normally use. It thought that would be the end of Paving Stonegate, but then they bought better rock and did this. Stick to the programme, Copenhagen. If you design something badly, that's a shame and you should know better. But when you have to pay to fix it in a sub-standard way and mess up the whole aesthetics of a street, that's embarassing.